• Atomic Force Microscope (AFM) system Dimension Icon from Bruker Nanosurface Division is equipped with a NanoScope V Control Station operating in a ScanAsyst Mode and using Peak Force Tapping technology. It offers surface images with resolution up to 5k x 5k, includes a scanning probe microscope (SPM) Scan Head with a XY nominal range of 90 x 90 microns and Z range of 10 microns. The microscope performs imaging techniques on samples up to 210 mm in diameter and 15 mm thickness. Differential scanning calorimeter Perkin Elmer DSC-8500, equipped with a cooler Intracooler 3 to ensure the operation in the chambers of the calorimeter from 130 оС to 900 оС in non-isothermal and isothermal mode with rate of heating and cooling of 0.1 to 200 ° C/min. • Determination of melting, crystallization, glass transition temperature, etc. Identification of high and low high molecular weight organic and inorganic compounds, (co)polymers, blends and composites. Investigation of powders, granules, foils, membranes, fibers and others. Determination heat (enthalpies) of transition (melting, crystallization, polymorphic-unit phase transitions, chemical reactions, polymerization, vulcanization, and other types of cross-linking). 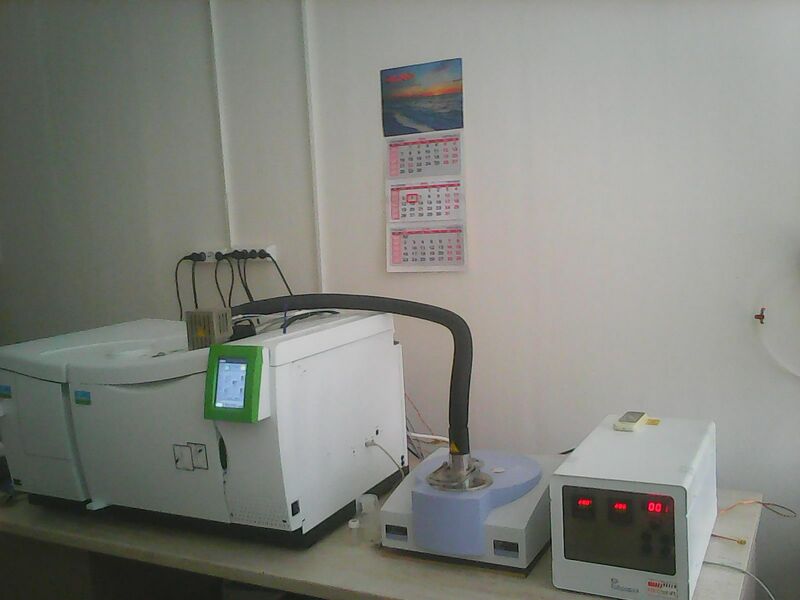 Determination of the specific heat at constant pressure, substance purity, degree of crystallinity, etc. A single column system for mechanical testing of materials and nanomaterials - INSTRON 3344. The testing machine has two load cells with capacity of 50 N and 2 kN, screw action grips, pneumatic side-action grips and jaws with rubber face. The machine is equipped with a compressor model Einhell, manual press model DVT NP, samples punch DVT NK K, and specialized software Bluehill. The machine is able to determine the mechanical characteristics of polymeric materials and nanomaterials (nanofibrous and nonwoven materials, gels and films). The equipment allows to determine: tensile strength, compressive and bending strength; Young`s modulus and modulus of deformation; maximum elongation at break. The relationship between the stress and strain (stress–strain curve) can be plotted and statistical analysis of the obtained results can be performed. 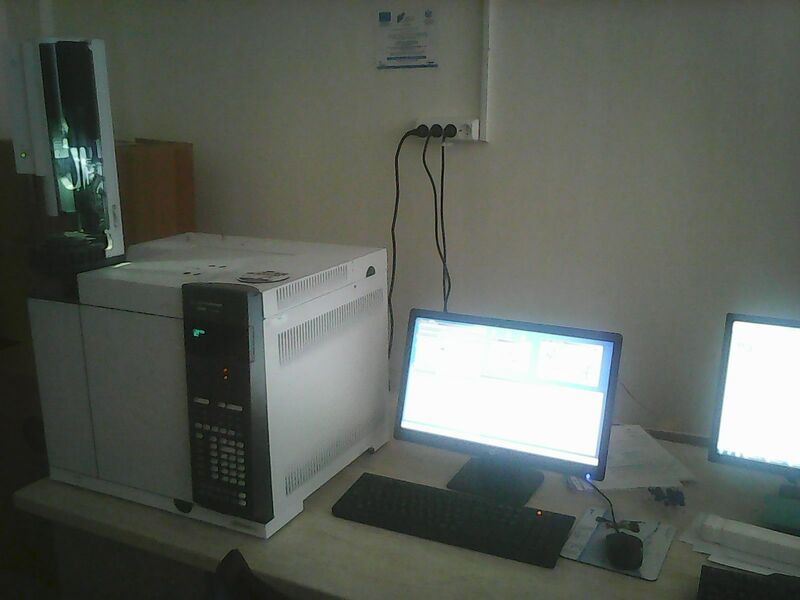 • Gas Chromatograph Agilent 7890B with capillary inlet for liquid samples with controlled flow split. Separation occurs in the gas phase in controlled nitrogen flow. 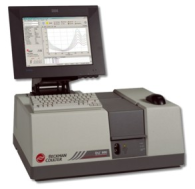 The equipment has a flame-ionization detector and an Agilent 7693A automatic liquid sampler. The gas chromatograph is supplied with three columns with different polarity and Clarity software for control, data acquisition and data processing. 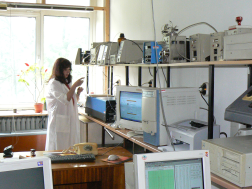 • The equipment is suitable for analysis of solvent and monomer purity, control of monomer content in polymers or reaction mixtures; qualitative analysis via retention time with standard substances; quantitative analysis by external standards, internal standard or standard addition. • Nexera XR Ultra High Performance Liquid Chromatograph, consisting of a quaternary pump, degasser, automatic injector, a column heater, provided with UV/Vis (SPD-20A) and differential refractive index (RID-20A) detectors. The separation is performed with a column for liquid (RESTEK Pinacle DB C18) or set for gel permeation (Agilent pLgel SEC/GPC) chromatography. Data acquisition and processing is performed with a LabSolutions LC/GPC software. - Quantitative analysis of the organic compounds in solution. It can be used in isocratic or gradient mode by mixing of up to four solvents. - The equipment is designed to analyze synthetic oligomers, homo- and copolymers, as well as modified natural polymers and to determine their composition and molecular weight characteristics: molecular weight and molecular weight distribution. - dynamic contact angle measurements in the range from 0 to 180°. The tensiometer is equipped with an optical zeta-sensor providing absolute measurement in the vertical position and built-in ionizer ensures highest degree of accuracy and eliminates any electrostatic charges. 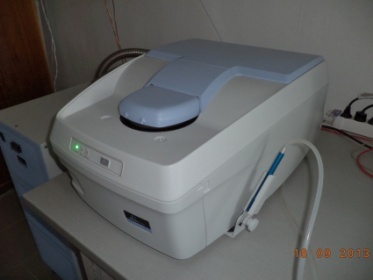 The system has a built-in thermometer and thermostated jacket for sample vessel and an integrated magnetic stirrer for optimal homogenization of the medium. 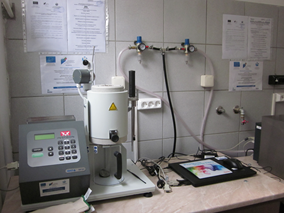 • The system enables the automatic measurement of surface tension of liquids (including polymer solutions in various solvents) by the Wilhelmy platinum plate method and by the Du Noi platinum-iridium ring method, as well as measurement of interfacial tension between two liquids. The dynamic contact angle of rectangular, round and cylindrical samples and advancing and receding contact angle by the Wilhelmy plate method can be determined. 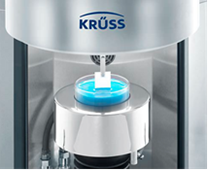 Additional sample holder ensures measuring the adsorption and wetting behaviors of powder samples by the Washburn method. 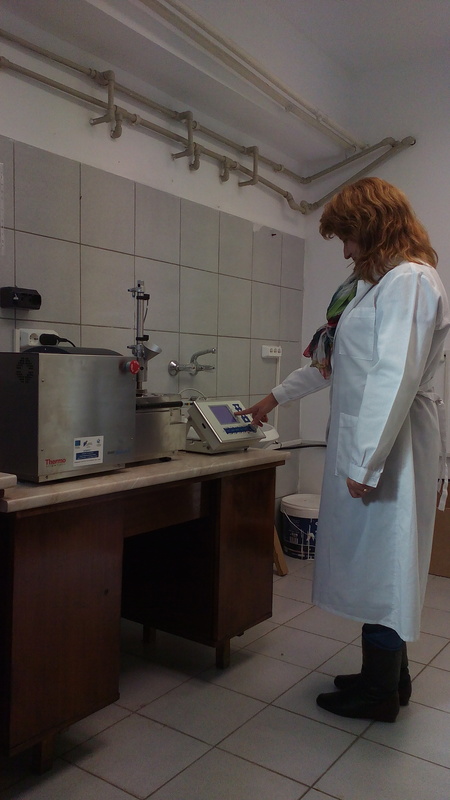 Wetting behavior of tablets, pharmaceutical active ingredients and excipients, foils, films, fiber bundles and textiles can also be measured. • Potenciostat/Galvanostat model PGSTAT204FRA32M AutoLab® with option to perform impedance spectroscopy measurements. 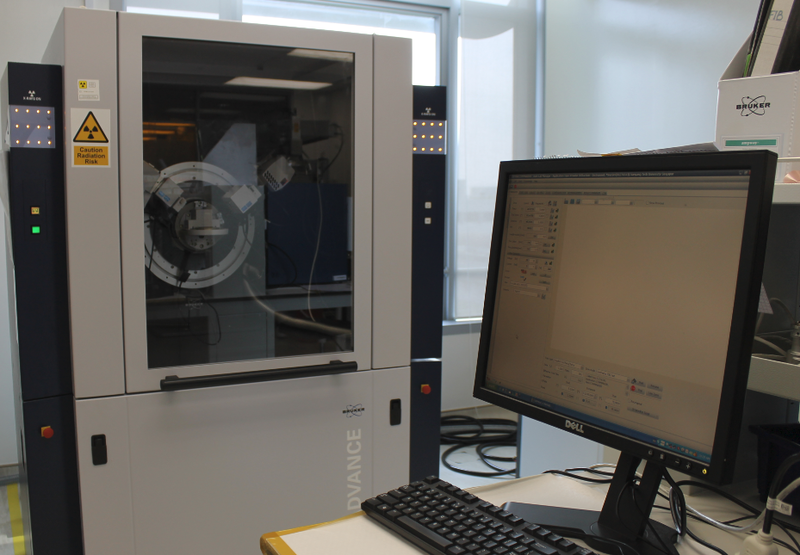 The equipment include a module for temperature and humidity control with special measurement cell model Fumatech® MK3. 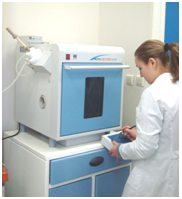 The measurement cell works in the temperature range 20-200°С and relative humidity up to 100%. • The integrated system gives opportunity for precise measurement and determination of the electron- and ion conductivity of polymer materials (e.g. proton- and OH- conductive membranes for fuel cells, electron conductive surfaces and composite materials etc. 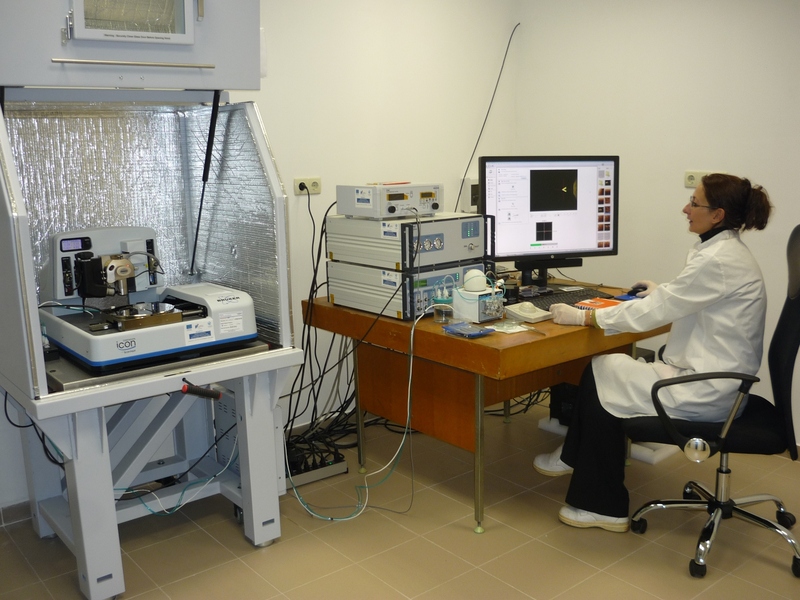 ), as well determination of the dielectric properties of electro insulating plastic materials. The conduct measurements could be performed at a wide temperature and relative humidity ranges with using minimal test sample size. The used platinum electrodes and the constructive Teflon coating material of the measurement cell gives the opportunity for testing of chemically aggressive polymer electrolyte materials and composites. INSTRON CEAST MF20 melt flow tester equipped with a melt cutting device of extrudate, a high-resolution digital encoder and a standard set of 8 test masses ranging from 0.325 kg (piston mass) up to 15 kg for testing a wide spectrum of materials. 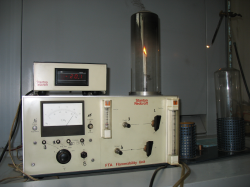 The instrument operates in the temperature range 50 to 450°С. The melt flow tester measures the melt flow rate (MFR) and the melt volume rate (MVR) of polymers and polymer composites according ISO 1133, ASTM D1238 or equivalent (Procedures A, B, C). • Тhe HAAKE MiniLab II Micro is based on a conical, twin-screw compounder ( L= 11.5 cm); with an integrated backflow channel; motor power 400W;max. speed max. 360 rpm; max. torque 5 Nm / screw; air pressure up to 200 bar; two integrated pressure transducers; two heating zones whit temperatures up to 350°C; extrusion of a small amount of polymer material (5 g .≤ m ≤ 10 g); manual and pneumatic feeding. The system is equipped with co- and counter-rotating twin screws; with an inert gas flush system; 5 extrusion dies ( diameter 0.5 mm, 1 mm, 1.5 mm and 2.0 mm, respectively; flat with a hole with dimensions 5 mm x 0.5 mm). Manual or computer control. • The micro compounder is designed for mixing and rheological measurements of small volume of polymeric materials; precisely controlled reactive extrusion of high viscous melts; for nano-composites, bio-polymers; testing of expensive additives; developing of new formulations. Two pressure transducers are integrated in the backflow channel. They allow the measurement of (relative) melt viscosity (counter-rotating screws required). Manual and computer control by specialized software Haake PolySoft allows monitoring, collection, storage and processing of data. 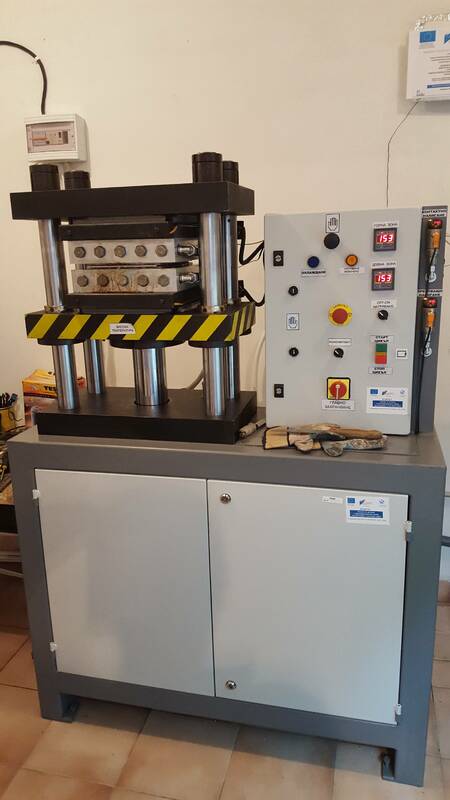 • The hydraulic laboratory press has two operating plates, that allow heating at 50 to 3000C with accuracy of ± 2 0C. Workload – up to 35 tons. • The press is equipped with two knives for preparation of standard sample bodies of pressed materials - ISO 527-2 (test body type 1A) and ISO 179 (test body type 1 without thread). Mini Spray Dryer В-290 Аdvance with module for organic solvents, model Inert Loop B-295, BUCHI. The equipment is suitable for use both aqueous solutions and 100% organic solvents. The flow capacity of aspiration module is 35 m3/h. 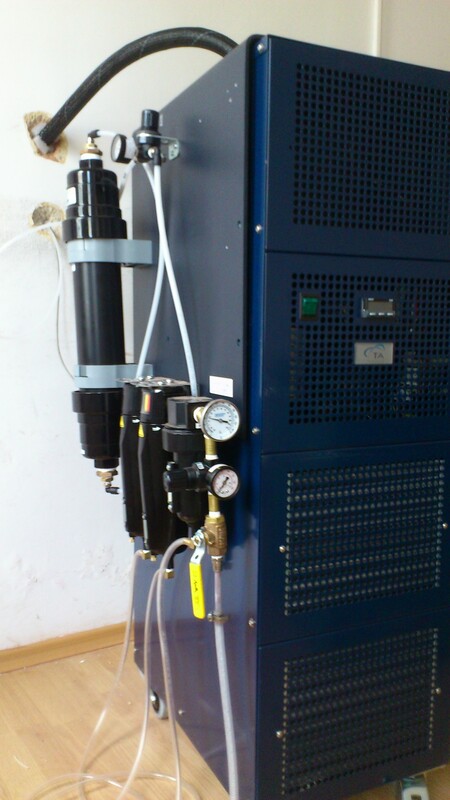 The equipment is able to control the flow of the spray gas. Dosing is by peristaltic pump with flow rate 28 ml/min and with the possibility of the simultaneous supply of more than one fluid. Module Inert Loop B-295 provides a closed circulation under inert conditions, equipped with sensors for monitoring the levels of oxygen and pressure. Output temperature of the module providing a closed circulation under inert conditions: -20° C; Power efficient cooling at -10° C is 800W. 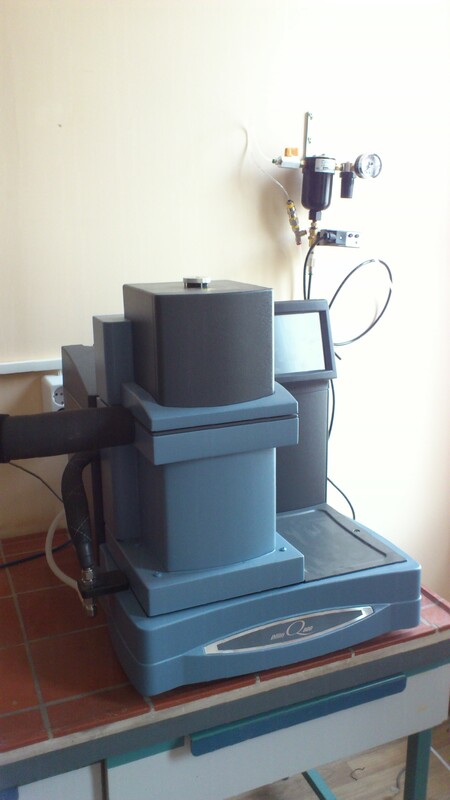 - Vacuum-drying of powders, granules and similar products. 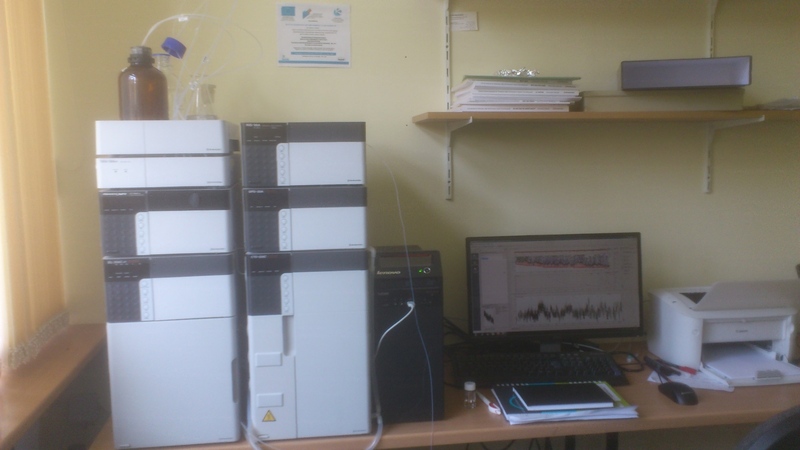 • Gas Chromatograph Clarus600 with a mass-selective detector SQ8 - PerkinElmer. The gas chromatograph is equipped with two Valco gas valves, additional membrane vacuum pump for introduction of gas samples and a RedShift control module for gas valves and two additional temperature zones. 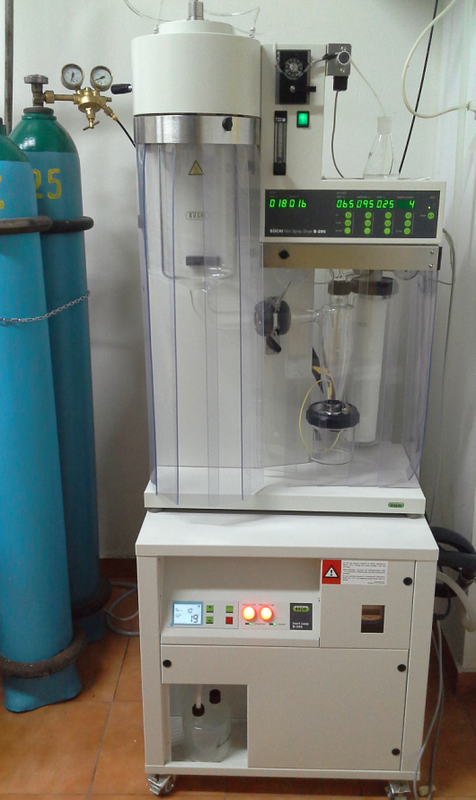 The valve system is connected via heated transfer line to thermogravimetric analyzer PerkinElmer TGA4000. The equipment is supplied with PYRIS software for thermogravimeter, TurboMass software for mas-selective detector and NIST spectra library. - Thermogravimeter – measures mass change in inert gas flow (argon) with controlled temperature elevation. 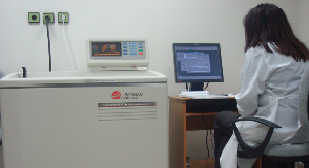 - Gas chromatograph with mass-selective detector – for manual injection of liquid samples. Capillary inlet evaporates the mixture of volatile compounds using controlled temperature program and helium flow and the separation in gas phase occurs. Mass-selective detector measures the spectra of separated substances. Qualitative identification of main components and impurities via NIST spectra library. - Combined TGA/GC/MSD – via gas-sampling valve the gas sample from thermal decomposition by the thermogravimeter is injected, separated and analyzed. Qualitative identification via NIST spectra library. - TGA/MSD – specific ion monitoring from thermal decomposition by the thermogravimeter. Argon flow without gas phase separation. 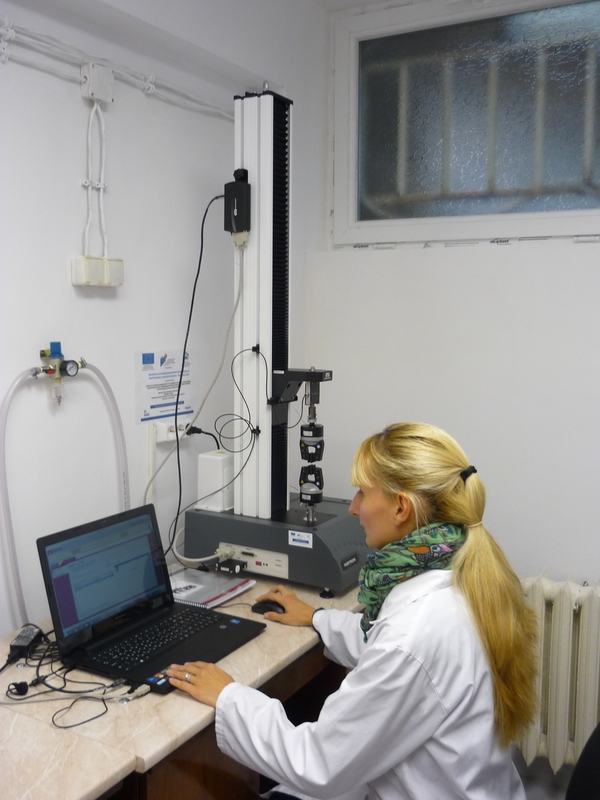 Quantitative measuring of degradation products. • Ti 803 stand for volumetric Karl Fisher water content determination. • tiamotm software for complete system management, data storage and processing. • Unitrode easyClean Pt1000 eElectrode for aqueous acid-base titrations with function for easy cleaning of the membrane and integrated reference electrode LL Ag/AgCl; pH range: 0÷14, temperature range 0° C to 100 °C. • Solvotrode easyClean electrode of non-aqueous acid-base titration with a function for easy cleaning of the membrane, pH range: 0÷14, temperature range 0°C to 70 °C. • Ag Titrode electrode for determining chloride; measuring range: ≤1.10-6 to 1 mol/L; reproducibility of measurement: ≤ ± 2%; temperature range 0°C to 80°C. • Temperature sensor Pt1000, temperature range -50°C to + 180°C. Application: for quantitative determination of content of functional groups (carboxyl, hydroxyl, halides) and water (0.1-100%) in monomers and polymers. Advance ECO has the ability to perform a full range of applications, from qualitative and quantitative phase identification, crystal structure solution from powder samples, crystallite size determination, micro strain analysis, residual stress analysis, and preferred orientation. 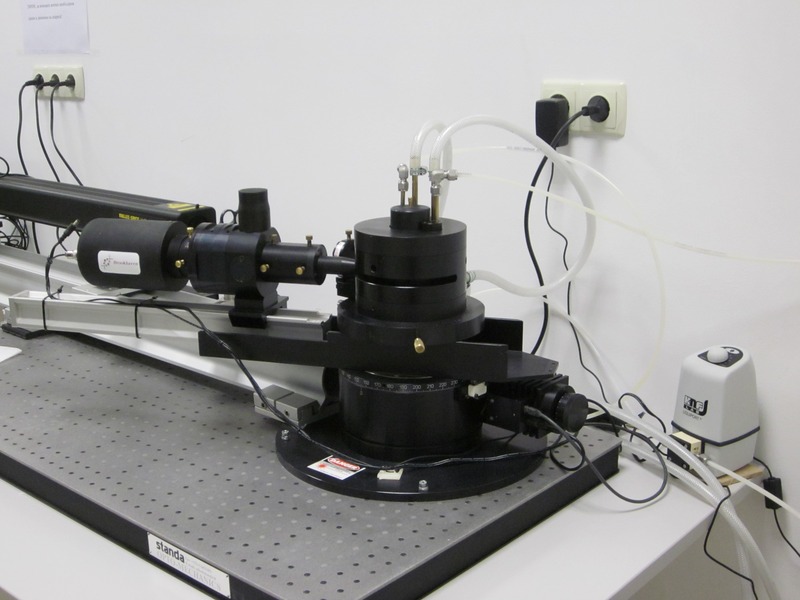 The system BI-200SM of Brookhaven Instruments allows performing studies of both static light scattering (SLS) and dynamic light scattering (DLS). Within SLS, measurements of scattered light intensity at fixed angles or variable angles over the measurement range from 12 to 155 degrees with a resolution of 0.01 degrees can be carried out. The results from the measurements are interpreted according to the methods of Zimm, Berry, Debye, Guinier, Kratky, etc. Weight average molar mass (Mw), radius of gyration (Rg), and second virial coefficient (A2) of homopolymers, copolymers, and self-assembled structures in solution can be extracted from the data. Within DLS, particles sizes from the lowest nanometer range up to the micrometer range can be calculated via measurements of relaxation time. Relaxation rates, particle sizes, diffusion coefficients, particle size distributions of polymers in solution, colloidal systems, self-assembled and co-assembled structures can be determined. 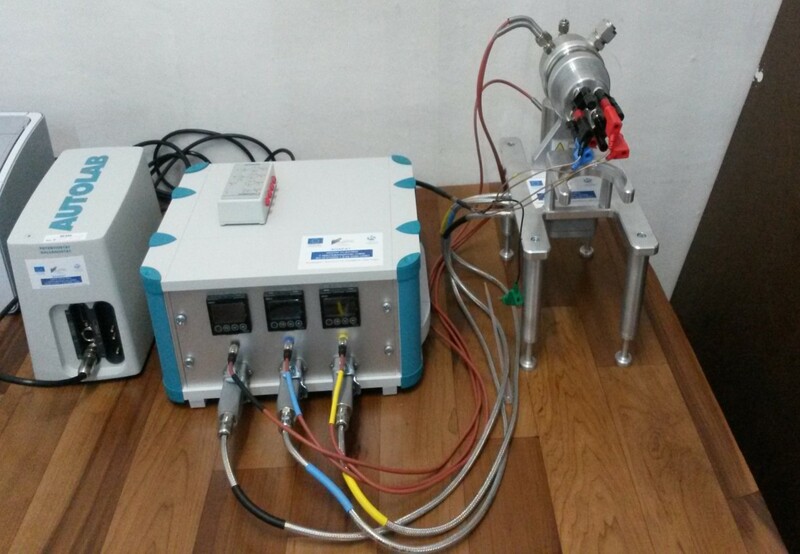 The system is composed of a 30 mW, 633 nm HeNe laser, a thermostated sample chamber with a vat, containing an index-matching fluid, a continuously working filtration unit, and an avalanche photo diode detector, installed on a rotating arm. glass transition, crystallinity, cross-linking effects, fatigue and other transitions can be determined with DMA. - Dual cantilever is suitable for highly damped materials and to study cure of supported materials. - Single cantilever is useful for most neat thermoplastics and stiffer materials. 2. Three-point bending - for medium to high modulus materials. 3. Compression - for low to medium modulus materials. 5. Tension - for thin films and fibers with high modulus. three-stage cascading compressor design, enabling testing to temperatures as low as -100°C. Gel permeation chromatography (GPC) station (Waters, Millipore Corp., USA). It consists of two lines: one running at ambient and temperatures up to 45oC; the second one - at higher temperatures, both connected to refractometric and UV-detectors. The station is equipped with two sets of columns for aqueous or organic solvent medium. Static light scattering (SLS) module Wyatt DAWN DSP (Wyatt Co., 1997, donation) is coupled with the GPC line in order to determine the absolute molecular mass characteristics and size of particles simultaneously. The ProteomeLab XL-I is configured with two detection systems: (i) a scanning UV/Vis detector that provides sensitivity for low-concentration work and selectivity for optimizing detection based on the sample's maximum absorbance and (ii) Rayleigh Interference Optics system which provides the capability to measure the change in refractive index resulting from changes in sample concentration. The instrument can collect data from both detection systems sequentially to provide the broadest spectrum of data for macromolecular characterization in solution. The ProteomeLab XL-I functions over a wide range of concentration, temperature, ionic strength and pH and allows examination of a wide selection of samples. The operating methodology measures molecular weights and sample heterogeneity, stoichiometry and self-associating systems. 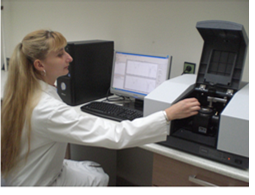 It determines species parameters such as sedimentation and diffusion coefficients. Because the ProteomeLab XL-I's measurements are based on the first principles of thermodynamics and hydrodynamics, no standards or calibrations are required. The measurement requires volumes as little as 15 µL to 450 µL of sample and reference solutions that are injected into opposing positions in the cell assembly. Two rotors (4- and 8 hole rotors) are available which allows up to 7 different sample/reference pairs can be studied in a single run, with each having a different set of solute/solvent conditions (pH, ionic strength, concentration). Your sample can be retrieved for additional analysis. Acknowledgement for the financial support of the National Science Fund under contract DО 02-82/2008 (project CVP-01/0106 within the frame of the call “Centers of Excellence – 2008”. 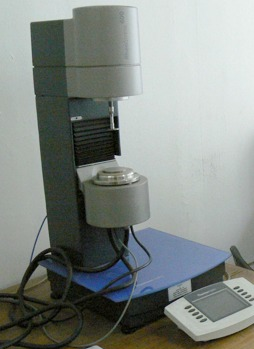 The HAAKE RheoStress 600 high-end rheometer performs all types of measurements in rotation and oscillation modes. 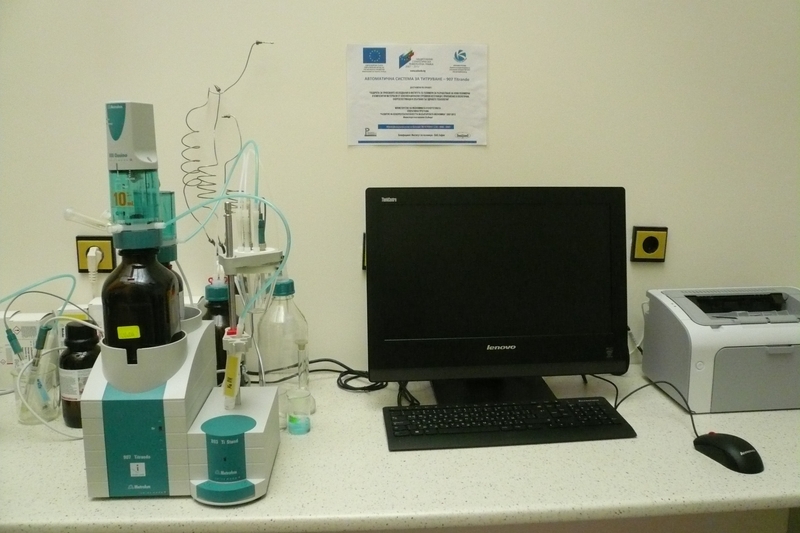 Fully modular, it can be quickly adapted to suit a wide range of requirements for rheological analysis of polymer solutions, pastes and hydrogels. Acknowledgement for the financial support of the Alexander von Humboldt Foundation. The DU 800 Spectrophotometer operates in the wavelength range of 190 to 1100 nm and has a bandwidth of <= 1.8 nm. The focused micro-beam design provides a wide linear range and other specific benefits for small volumes and precious samples. The IRAffinity-1 offers the highest signal-to-noise ratio (sensitivity) in its class at 30 000:1, with a maximum resolution of 0.5 cm-1 (according to Shimadzu's investigation in January 2008). The unit achieves this level of sensitivity by using a high-energy ceramic light source; temperature-controlled, high-sensitivity DLATGS detector; and high-throughput optical elements. Also, the IRAffinity-1 includes optimized electrical and optical systems to minimize noise levels. IRsolution software, standard in the IRAffinity-1, performs data processing and analysis. The limiting oxygen index LOI test (ASTM D2863) is used to determine the minimum concentration of oxygen in an oxygen/nitrogen mixture that will support a flaming burn in a plastic or composite specimen. It requires relatively small specimens and has the advantage of producing a single numerical value which is an indication of relative flammability. 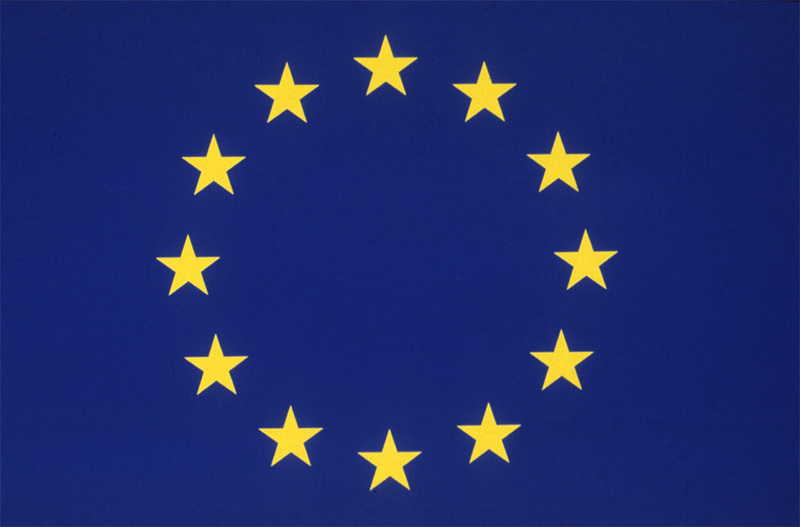 For plastics, the test has been shown to have good precision and reproducibility. The Milestone innovative RotoSYNTH combines all the advantages of microwave-enhanced synthesis, with the unique capability of physically rotating the reaction vessel, to achieve very homogenous bulk heating of heterogeneous reaction mixtures. It offers an extremely high flexibility of operation in open vessel, closed vessel or under vacuum, with full control of all reaction parameters (time, microwave power, heating and cooling rate, temperature, pressure, and vacuum), in a very safe environment.